In this series (1,2,3) I've been dealing with verses which are often used in claims against the ethical legitimacy of homosexuality. But here I want to deal with a part of scripture that's almost never used in the argument--the Gospels. They're almost completely ignored in the discussion and I think it'd be a mistake to follow that pattern. Some have suggested that you can separate Christians into two groups: Paul people and Gospels people. Well, while I appreciate Paul, am fascinated by Paul, and see Paul as vitally important, I'm really more of a Gospels person. I am obsessed with Jesus and his teachings. Paul is a great pastor who found incredibly articulate ways of explaining the gospel and opening the reality of Jesus to those to whom it had not been opened. But it's really all about Jesus. Jesus was the point that Paul was getting at. Some people think that the Gospels should be read as secondary texts, subject to Paul, but perhaps it should be the other way around, perhaps the Gospels are really where we should start if we really believe that Jesus, and not Paul, is God incarnate. To see what's important to God we should look to Jesus. What Jesus cared about, God cares about and what God cares about, we who bear God's image should care about. Interestingly enough, while the Church has made a huge fuss about homosexuality, overemphasizing Paul's alleged condemnations thereof, Jesus was silent on the subject. One would be hard pressed to find a verse that could possibly be applied to the issue. That should at least raise a red-flag for us. Someone will claim that the whole Bible should be taken equally - and in its own way, that's true. The whole Bible is the Word of God and all of it is important. But because it's real, because it's not just some magical book and because we're flawed people,, we all have to make choices about which parts of scripture are subject to others. We've got to read it as a whole, as one grand narrative, deciding how each part functions in the plot in relation to others. For example, we make James' claim That "a person is considered righteous by what they do and not by faith alone" (James 2:24 NIV) harmonize with Paul's claim that "it is by grace you have been saved, through faith... not by works..." (Ephesians 2:8, 9 NIV). When we come across an apparent contradiction, one passage often becomes subject to the other. So if the New Testament is, in essence, subject to the Gospels, If Jesus is the point of the whole narrative then it should be at least a little bit of a hint to us, a warning, when a subject with which we've been so obsessed is actually absent from the teachings of Jesus. If it was as important to God as the Church has made it out to be, why didn't Jesus bring it up? He certainly could have. What is obviously important to Jesus is standing for and with the marginalized. That much is clear. Jesus shared his very identity with "the least of these" (Matthew 25). He shared meals with and affirmed the humanity of the outcast, and the oppressed. Jesus loved the people who were most the abused and mistreated in society. It should be obvious to us that gay people today are marginalized in our culture and their abuse has been implicitly or explicitly condoned by the church. 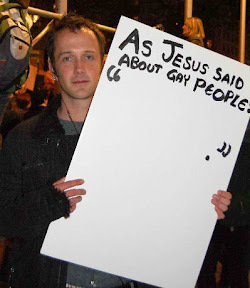 It doesn't even cross our minds as abuse, but when someone can say that homosexuality is "detrimental" to society (as Kirk Cameron recently did) without blinking, it has a dehumanizing affect on our gay brothers and sisters. Jesus invites us to stand with the marginalized and affirm their humanity. Some think that I'm doing way too much work to "justify" homosexuality. But it's only because I take the invitation of Jesus in the Gospels very seriously. You see, as disciples, we cannot be neutrally reading scripture without real people in mind. Without gay people in mind, it's easy to simply say, "when in doubt, just read everything literally." As disciples of Jesus, however, we have the obligation to consider even the slightest possibility that what our gay brothers and sisters say about themselves is true. My gay brothers and sisters, generally speaking, see homosexuality as an essential aspect of their identity. They don't believe that they're being sexually immoral. And, most importantly, they see condemnation of homosexuality as condemnation of their identity. "love the sinner hate the sin" just does not compute for them because they are that which we are calling "sin." And so, as a disciple of Jesus, I allow the experiences of others influence me, to challenge me with compassion and love, and to incarnationally become part of my reading of scripture. If we let the things that are most important to Jesus become most important to us, then it will challenge our perceptions and take us outside our comfort zone. Jesus was silent about homosexuality but he was not silent about religious people persecuting others, allowing their religious ideals to become more important than their love for people. He was not silent about people who condemned people in the name of God... and he didn't have nice things to say about such folks. Perhaps our reading of scripture should be subject to the things that were important to Jesus. When we do that, I'm convinced that the Bible will be a tool for the liberation of gay people rather than for their condemnation. I continue to be informed by James D. G. Dunn and his work on the "new perspective" on Paul. Especially how he explains Paul's sense of the importance of Jesus' crucifixion - the Messiah becomes outcast according to Jewish law, by being "hung on a tree." God's justification of him in resurrection breaks down the old barriers of in and out and includes/incorporates all outcasts through the outcast Jesus.